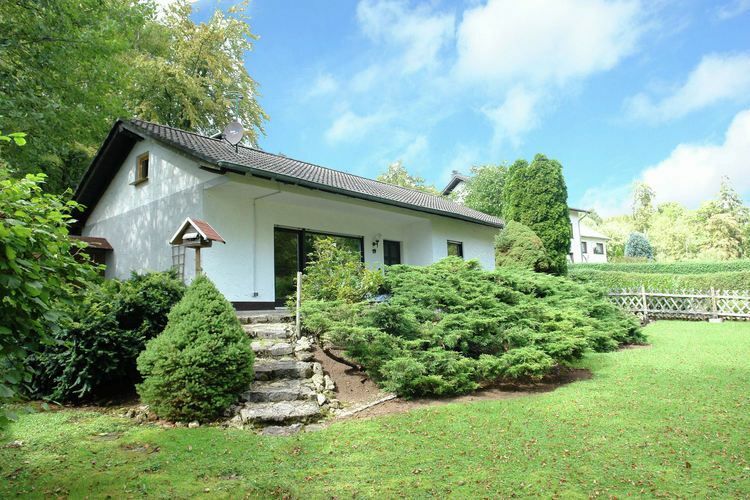 This detached holiday home (86 m2) is located right on the edge of the forest in the small, idyllically situated town of Feusdorf. The house has a lovely garden with a small conservatory behind the house which was custom built by the owner, as well as an outdoor fireplace for grilling. And the covered terrace is a great place to enjoy a glass of wine in the evening. Feusdorf is part of the Oberes Kylltal recreational area in the Eifel mountains. The Eifel landscape was shaped by past volcanic activity. The many volcanic lakes, such as the one which can be visited near Daun, are a testament to this. The Eifel is well worth a visit any time of year. The diverse landscape, with its mountains, forests, meadows and rivers, is excellent for hiking and cycling. The gentle curves and slopes of the region's roads are popular with motorcyclists as well. Other recreational opportunities include horseback riding, golfing, fishing, tobogganing and both downhill and cross-country skiing. In addition to the many daytrip destinations in the Vulkan Eifel region, the historic cities of Cologne and Trier are also an easy train ride away. The Jünkerath train station is about 2 km away (and offers plenty of parking). The DVD-player is a Blu-ray-Player. Very nice house. Detached, so total privacy. Very friendly and helpful managers. A house where, even if you z 'n sixes, you have enough privacy to find. Nice decor. Highly recommended. House used as a base for motor weekend.Goede environment with nice roads. Thank you to the property manager and owner. A comfortable and cozy house. Bei der Ankunft fanden wir alles so vor, wie in den Unterlagen beschrieben. Die Hauswände könnten mal wieder einen Anstrich vertragen, die Gartenstühle könnten mal überholt oder erneuert werden und der Wasserkocher müsste entweder entkalkt oder erneuert werden. Ansonsten waren wir eigentlich sehr zufrieden mit dem Ferienhaus. Es liegt zwar an der 'Hauptstraße' zum Nachbarort und ist daher nicht völlig ruhig, aber durch den Friedhof gegenüber gleicht sich das dann wieder aus. Etwas nervig ist das automatisch angehende Flurlicht, das 24 Stunden am Tag auf Bewegung hin anspringt und das man nicht abstellen kann. Die Inneneinrichtung ist teilweise etwas retro (Badezimmer) und die ständig bullernde Heizungsanlage darin nervt etwas im direkt angrenzenden Schlafzimmer. De woning was super schoon bij aankomst, dat is altijd wel erg prettig. Complimenten aan het echtpaar dat het onderhoud doet. De inventaris van de keuken, met name de meeste pannen zijn wel aan vernieuwing toe. Ik miste kommetjes bij het servies, verder was het servies compleet en voldoende. De wintergarten was heel prettig om te verblijven. Onze hond kon overal lopen, de omheining was ook erg prettig.